KENWORTH is about to adios the big-selling T359 and T409. In their place come new-generation offerings the T360 and T410. 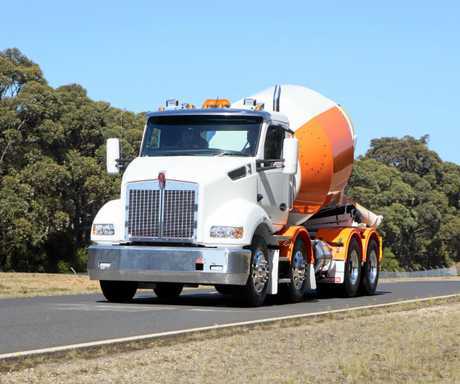 While the new additions to the Kenworth range in Australia might not look significantly different (the front end is a little rounder and the headlights are different), under the surface there are significant changes. One welcome change is a redesign of the cab's stairway. Aimed primarily at agitator and car carrier applications where operators are in and out of their trucks frequently, the new design has the stairs cascade out, enabling drivers to see each step as they ascend. Both new trucks feature the same wider 2.1m cab found on the new Kenworth T610 and that means greatly improved visibility from the driver's seat. The enhanced visibility comes primarily from a redesign of the door windows, while in the new models the seats are positioned further forward and this also brings visibility improvements (more on that in a sec). One noticeable feature of both the new T360 and T410 is the redesign of the mirrors. The new trucks welcome a single arm mounting (at the base) that is fastened to the body near the A pillar. They sit very low and this helps give you some visibility over the top of them. That's pretty clever. Electronic adjustment extends only to the main mirrors, however. The redesigned cab also brings another advantage - shorter bumper to back of cab length (BBC). In total, a significant 100mm has been shaved off the cab, giving more space for bodies and loads, while, as mentioned previously, the shorter cab brings the human occupants further towards the front as well. Focusing solely on the Kenworth T360 for a moment, some of the other changes over the outgoing T359 include a significantly improved turning circle. 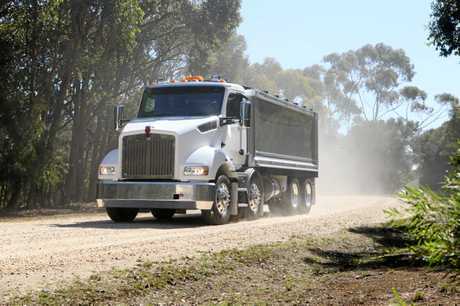 PACCAR engineers tell us they've managed to recognise the improvement in manoeuvrability, up to about 2m, through "enhanced steering geometry”. Up to a 100kg weight reduction has also been achieved. Under the bonnet of the Kenworth T360 is a significant change - the withdrawal of the higher- capacity Cummins ISMe5 engine. Previously available in the T359, the up to 440hp 11-litre engine has made way for just the one engine option - the 9-litre Euro 5 compliant Cummins ISLe5. The smaller-capacity Cummins engine will be available in outputs ranging from 280hp to 400hp (up from previous 380hp max). Transmission choices run to the Allison 3000/4000, and there's also the Eaton manual or UltraShift Plus on offer. The Kenworth T410 also comes with just the one engine option and it isn't a Cummins, it's PACCAR's own MX-13 powerplant. Available in either 460hp or 510hp, the 13-litre engine, which is also found is other DAF and Kenworth models, is Euro5 compliant and delivers peak torque from just 1000rpm. It's also a 12V engine, meaning a 24V inverter isn't required. When mounted to the standard PACCAR 12-speed transmission (rated to up to 50 tonne), operators will enjoy up to a 90kg weight saving. Other transmissions available in the T410 include Eaton manual and UltraShift. The all-important driver environment hasn't been overlooked, with both models welcoming significant design alterations. Both the T360 and T410 come with a choice of standard trim and then wide customisation options. I spent time in both as a passenger and behind the wheel and was generally pleased with the layout, as well as the fit and finish throughout the cab. When driving the new trucks you really can see (literally) that the visibility improvements make for a safer and easier drive. The steering wheel is a little on the small side and very thick, and this takes a little getting used to. There's a large colour driver info screen mounted directly ahead of you on the instrument panel that gives you all the important information as well as the opportunity to have a fully digital speedometer. I thought the main gauges were nice and clear but the ancillary gauges are a touch small and this means you really need to focus in on them to get their readings. I didn't get a lot of time driving the new offerings but my observation was that the steering was nice and direct with very little vagueness. The cabs are nicely soundproofed too, not enough to disconnect you from the powertrain but enough to keep things comfortable over a long work day. The two-stage exhaust brake worked well, while be prepared to have to get used to the indicators being on the left-hand side of the Kenworth's steering column. What about safety? Well, there's still no airbags for either the driver or passenger but you can option your new T360/T410 with Electronic Stability Control, as well as the Bendix Fusion pack, bringing Adaptive Cruise Control, Autonomous Emergency Braking and Lane-Keep Assist. 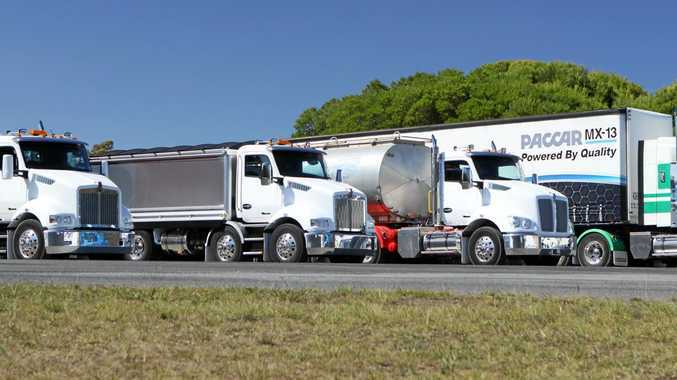 Set to be launched at the upcoming Brisbane Truck Show, where the order books will also be opened, there is a lot to like about these new Kenworth offerings. Some will lament the engine changes, no doubt, but the redesigned cab, extra load capacity potential, improved visibility and safer/easier ingress/egress into the T360 should offset any major customer dissatisfaction.